The second show of the series, Singing with Sylvia’s Christmas Concert, takes place on Friday, Dec. 17 at 10 a.m. Sylvia is cooking up some special goodies to share in this festive celebration of the season. 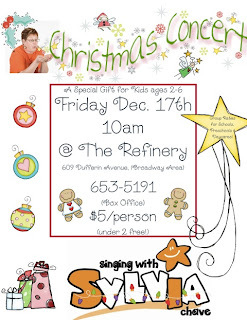 It will be a great opportunity to get in the Christmas spirit with songs, rhymes and laughter. Her final show of this concert series takes place during February break, on Friday, Feb. 25, also at 10 a.m. Sylvia will sing away the winter blues and have the whole family glowing as she celebrates winter in the most unusual ways. All shows take place at The Refinery, 609 Dufferin Avenue. Tickets for each show are $5 per person and can be purchased by calling The Refinery box office at 653-5191. Children under 2 years old are free. As a special holiday gift, Sylvia is giving pairs of Christmas Concert tickets to four lucky saskmom.com followers! You may enter this give-away twice. To enter, share your first name and a family holiday tradition. 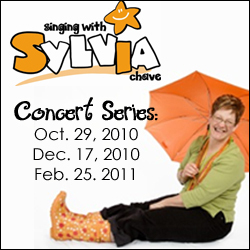 Earn a second entry by joining the Singing with Sylvia fan page on Facebook and letting us know below. Entries will close at noon on Saturday, Dec. 11. At that time, four winners will be selected through Random.org. Click on the link below to enter. Congratulations to Brandy, Stephanie, Chantal and Liz, entries 8, 11, 12 and 14! You are the four lucky winners of a pair of tickets to see Singing with Sylvia's Christmas Show on Friday, Dec. 17, at The Refinery. For those of you who weren’t so lucky, you may still purchase tickets for $5 per person (children under 2 are free) by calling The Refinery box office at 653-5191. Thanks to all who entered and shared your great holiday traditions, and a big thank you to Sylvia for sharing these tickets with us!